Superheroes and furry sidekicks — or maybe furry heroes and super sidekicks — will be in downtown Delaware as Main Street Delaware celebrates some of the city’s institutions during the September First Day. The evening of Sept. 1 will include the sixth annual pet walk, a hands-on display of equipment used by the City of Delaware Public Works Department, and a preview of the Delaware County District Library’s upcoming comic-con. The monthly event will take place from 6 to 9 p.m. Friday. Pet owners who want to participate in the ticketed treat walk through the downtown can purchase a ticket at $10 per pet. Owners will get a treasure map and a bag to collect treats from downtown businesses. The pet walk will step off from the Main Street Delaware tent at Sandusky and Winter streets. Registered pets will be photographed as they check-in for posting in a Main Street Delaware Facebook album. The pet receiving the most “likes” will be named “Furry Marshal” of Main Street Delaware’s upcoming Christmas Parade. First Friday will also feature a celebration at Ohio Living Sarah Moore, 47 E. William St., which is commemorating 125 years of caring in the community. The facility will give away dog treats and human treats (hot dogs, popcorn, cookies, brownies, and lemonade) during First Friday, provide tours of its facility, and make a brief presentation at 6 p.m.
“Our history involves a lot of very generous community members that invested a great amount of time, talent and treasure to make Ohio Living Sarah Moore what it is today. I have a great team of dedicated, professional and caring staff that truly make a difference in the lives of our patients and residents,” said Aric L. Arnett, the facility’s executive director. “We’ll also be awarding a gift basket, donated by Mutts & Co., to the best costumed furry friend in Main Street’s Pet Walk contest,” said Nicole Fowles, a library spokeswoman. The celebration is sponsored by Performance Chrysler Jeep Dodge Ram of Delaware, the Delaware County District Library, and by Ohio Living Sarah Moore. For tickets or more information, visit www.delawaremainstreet.com. 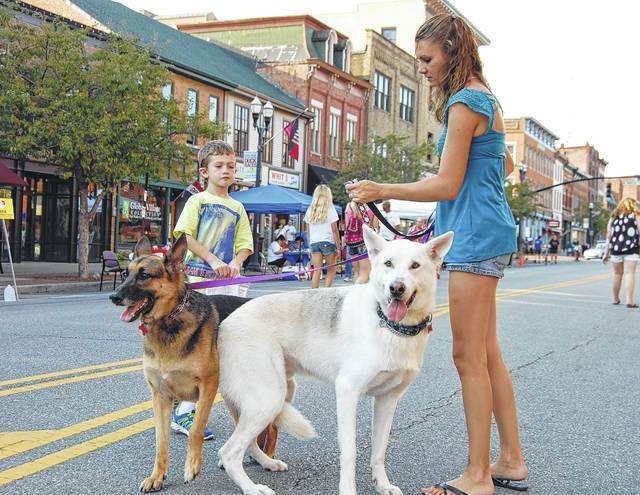 Furry friends will be welcome at Main Street Delaware’s First Friday on Sept. 1. The sixth annual Pet Walk will be part of the proceedings from 6 to 9 p.m. Friday. Pet owners who want to participate in the ticketed treat walk through the downtown can purchase a ticket at $10 per pet. Owners will get a treasure map and a bag to collect treats from downtown businesses. • Meet the author, Fundamentals Children’s Books, 25 Winter St., Delaware, 6:30 to 8 p.m. Friday. Jennifer Maschari will sign copies of her novel “The Remarkable Journey of Charlie Price” and her newest book “Things That Surprise You.” Maschari is a classroom teacher. She lives in Ohio with her husband and English bulldogs, Oliver and Hank. For information, call Fundamentals at 740-363-0290. • 2017 Parade of Homes, Cheshire Woods, 11 a.m. to 7 p.m. Saturday. The Building Industry Association of Central Ohio will kick off the opening day of its parade of homes. The tour of will take about two to three hours to complete to view nine homes. Tickets are $15 for general admission and free for children 12 and under. The parade will run each day until Sept. 17. For information, visit www.biaparade.com. • The Little Brown Jog 5K and Kids Fun Run, Delaware County Fairgrounds, 236 Pennsylvania Ave., 7:45 a.m. to noon Sunday. The inaugural event will allow people to start and finish on the racetrack where the Little Brown Jug occurs. Proceeds will benefit People In Need. For information, visit www.delawarepeopleinneed.org. The Glass Castle (PG-13): [2 p.m.], 5 p.m., 8 p.m. The Glass Castle (PG-13): 1 p.m., 4 p.m., 7 p.m.